After a head-on collision on Sunday night, a family’s dog got scared, jumped out of their wrecked car, and disappeared into the night. 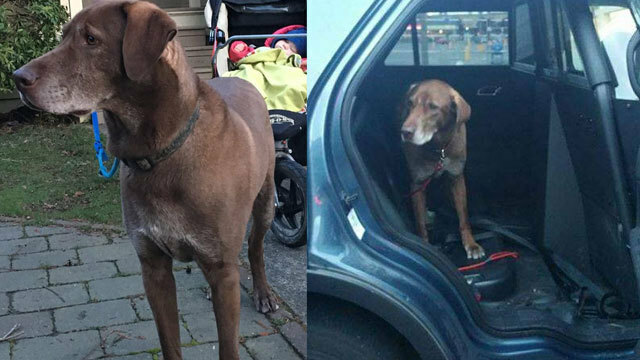 Zaley, a chocolate lab, showed up at a local pet store several hours later. When an employee showed up to work the next day, she called the number on Zaley's tag and was able to reach his owner. One member of the family sustained serious injuries in the crash, but is expected to recover; the woman in the other vehicle who caused the accident by drifting across the center line was taken to a hospital with serious injuries. A car crash in Yakima last Thursday night left a 14-year-old boy in serious condition. The boy was a passenger in a car that fled from police at high speed before slamming into another car. Police did not engage in a pursuit, but reported that multiple officers had seen the car driving erratically before the crash. The car’s driver and two other passengers fled the scene, leaving the 14-year-old behind. A 7-year-old girl died after being struck by a car on Saturday in Everett. Bystanders performed CPR and medics arrived at the scene, but they were unable to revive her. Police are still investigating the cause of the accident; they told reporters that the driver stayed at the scene and is cooperating with the investigation. A semi-truck that rolled over early Monday morning forced authorities to close the westbound lanes of Interstate 90 for several hours while they removed the truck from the roadway. The truck was dragged out of the way of traffic by 8:30 am, but crews had to wait until later in the day to right the truck. Two people were injured after the car they were riding in was hit by a second vehicle in in Tuesday morning in Lynnwood. That driver left before police arrived. Both people sustained minor injuries in the crash and were taken to a local hospital. Police are still looking for the driver who fled the scene. A motorcyclist was struck by a car on Tuesday afternoon in the 10500 block of Paradise Lake Road near Maltby. He was pronounced dead at the scene after attempts to revive him were unsuccessful. Police are still investigating the cause of the accident; they told reporters that the driver of the vehicle that struck the motorcyclist remained at the scene and was cooperating with the investigation. A bicyclist was taken to the hospital after being struck by a vehicle in Seattle’s Ravenna neighborhood. Witnesses reported that the vehicle involved appeared to be owned by King County Metro Vanpool, which lends vehicles to commuters who wish to carpool to work instead of driving in private vehicles. A man was killed in a car accident while he was searching for his 11-year-old child, who he believed was missing, on Thursday. His SUV went off the road. Two younger children in the car, a 5-year-old and an 8-year-old, survived the crash. They told emergency responders that the driver appeared to have been on his phone at the time of the crash. Police do not believe that drugs or alcohol were factors in the collision. The 11-year-old was found safe at a local high school. A pedestrian was struck by a car while crossing the street in Seattle’s SoDo neighborhood on Thursday morning. Police believe that the crash occurred as the car was travelling at approximately 20 to 30 miles per hour. The victim reported leg and hip pain after being struck.